I just ate an orange. Some choices are easy. I haven’t had much of an appetite lately. The only tough part was peeling it. 😛 I also bought one of those Reese’s Peanut Butter Eggs, even though I really haven’t had a yen for chocolate much. It’s like — too rich or something. Being indecisive, being unsure of what I want or need is so frustrating. Yesterday on the way home from getting my cast put on, Mom and I settled on a restaurant for brunch. That was also easy: The Honey Tree, within walking distance of our home. Even so, I stared at the computer for ten minutes or so before I decided on corned beef hash with over easy eggs. Whew. Plus, nobody makes corned beef hash like The Honey Tree. Today, though, it’s been harder, and I’m not sure why. Part of it is I have so much on my mind. Things are bad in some of my relationships, I keep rewinding things in my head to figure out what I could have done differently — for God’s sake, choosing a t-shirt or sweatshirt has become a minefield. So, I was on Netflix (instead of writing) looking for a movie I might like: thriller or horror. In dialectical behavior therapy, they tell us to use opposite-to-emotion thinking when problems arise. So, because I felt overwhelmed and sad, horror or thriller, I thought, might bring me out of a funk. Except that there were too many choices, and too many movies looked good. I’d pick one, start to watch it, get bored after about 15 minutes, try another one, ad nauseum. Finally, I just turned it off. The silence felt good, and I took a nap without feeling a lick of guilt, because I know we heal more quickly in our sleep. What sorts of decisions are hard for you to make? All right. This is not an apology, this is an explanation. There’s a reason I have been so flaky lately with my posts . . . well, this whole entire month, specifically. Last year, when I tried to crochet Christmas presents, I didn’t start working until like October or even November, and of course didn’t get finished in time. I have a large family. So this year I began in January. So far I have two granny square blankets crocheted. I just have to put them together. 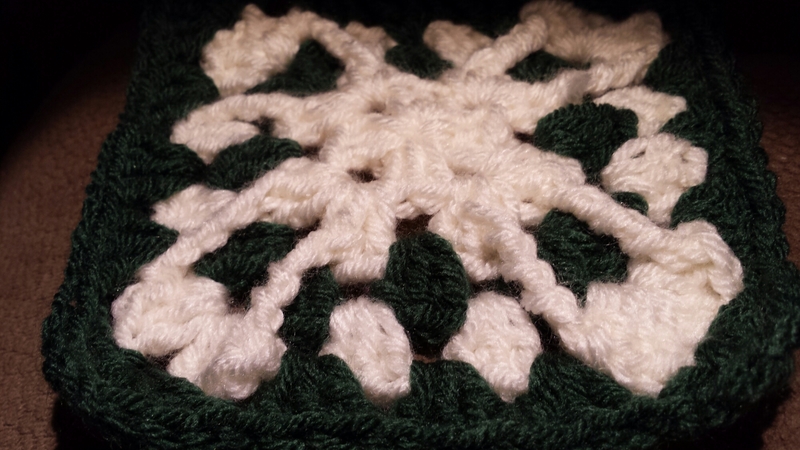 I’m working on my third (pictured above) which looks like snowflakes! I have 30 out of 88 squares done. As with most anxiety problems, it’s hard to know the exact cause, but performance anxiety is also self-sustaining, because it creates a mindset that focuses only on mistakes and seeing others as judging you. One small mistake, even if no one notices, or one person in the audience that looks unhappy and all of your fears are reinforced, causing more performance anxiety to happen later. No matter the effects of anxiety, there is no denying that anxiety itself can create more anxiety. The more you are worried about your performance, the more your performance suffers. Pre- and Post- Presentation Positive Writing Exercises – Since anxiety is a problem with negative thinking, one way to combat anxiety is to force yourself to think positively. An example of this type of exercise includes writing out 10 or 20 genuinely positive thoughts about how you performed or will perform. It’s not perfect, but it will stop you from focusing only on the negative. Positive Support – You also need support from others. It’s easy to think about the negatives when you mess up – or when you have the possibility of messing up. But if you can find people in your life that are always supportive, you won’t care as much about any mistakes because others in your life will make things easier. Positive support is very helpful for this type of anxiety. Happy Distractions – Much of performance anxiety is not what happens at the time of the event, but what occurs before and after it. This is when the mind can wander into negative thoughts. Keeping yourself mentally active and busy prevents the mind from focusing on the negatives, especially if you can focus on more positive activities like going outdoors and spending fun time with friends. Practicing Under Pressure – It is often hard to practice under pressure, because practice itself rarely has that much pressure. But if you can get used to being under pressure situations, then when you actually face some type of pressure it won’t cause as much anxiety. For example, if you are giving a speech, do it in front of smaller crowds and work your way up to the bigger ones. If you are playing sports, practice playing where people challenge you with noise and energy – just like you would experience in a big game. This will help you get used to some of the components of pressure situations, even if it doesn’t resemble it completely. Fino a domani, I miei amici! Mwah! In retrospect, this month-long challenge was good for me. I can still say that, even after the whining, complaining, staying up at night thinking about topics, taking forever to write, obsessing, worrying, and stressing so much that I made myself ill. I loved every haphazard minute of it. You bet I did. But it all starts out the same way. It’s like “Oh, a challenge! Shiny, Shiny!” And then after a few days it dawns on me that this is a daily ritual and I made a commitment and all those other big scary words most adults should never have to hear in their lifetimes. See, I’m not good at commitment. I like to make a big splash in the pool, then grab my towel and walk away. I’m a good starter, so I need other people around me who like to finish. You know? But I found that there were a few deeply disturbed individuals following my blog posts whom I simply did not want to let down. 😉 The more they stayed with me, the more it made me want to complete the challenge. I learned that I indeed had the stamina within me to complete things. I had completed NaNoWriMo twice before. But it seemed much harder to show up for a blog post every day of the week except Sundays. It says to your readers: You matter to me. I care about you, and I’m here. This is a bonus post for the month. My schedule, as you know, is normally M, W, F, and Sun. But the Powers That Be, this was important to them. And helpful for us as well, I think.